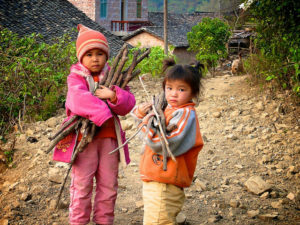 Village children collect firewood for cooking fuel, Tianlin County, Guangxi Zhuang Autonomous Region, China. Photo by Nick Hogarth for Center for International Forestry Research (CIFOR). The past month has seen a fierce international and academic debate flare up again over the large-scale use of wood to produce energy, notably in Europe. When we agreed on “Forests and Energy” as the theme for this year’s International Day of Forests on 21 March, we had no idea that there would be such a timely opportunity to share how forests and biomass can deliver crucial energy to support the livelihoods of billions of people, and at the same time provide major opportunities for our climate-smart future. Bioenergy is energy produced from biomass and waste. The share of bioenergy in the global energy mix has been about 10% over past decades – about double that of the nuclear energy supply and five times that of hydro energy, from a baseline of 2014. The majority of bioenergy comes from wood and plants, often in the form of by-products from agriculture or forestry production. Some 2.6 billion of the world’s poor (equal to 40% of the global population) depend on traditional forms of bioenergy for cooking, heating and income, making it a major factor for livelihoods and food security worldwide. An earlier controversy arose over the links between liquid biofuels and food security (see, for example, studies by FAO, IFPRI, IIASA and CFS). Liquid biofuels, such as ethanol and biodiesel, constitute a small fraction of bioenergy use. While the use of liquid biofuels has increased in recent years, it remains only about 0.5% of all energy consumed (see statistics here). Biofuels became popular in government policies, first to improve domestic energy security and later also as a means to reduce climate impact. Liquid biofuels are particularly useful in the transport industry, and some recent studies show they could have unexpected climate benefits. But considerable subsidies offered for the production of biofuels have led to questions over undue competition with food production on lands suitable for agriculture. These have impacted food prices and food security. Socioeconomic, ethical, environmental and rights-based arguments were raised at the 2008 Food Summit in Rome. Policies around liquid biofuels remain contentious, although there are expectations that new technology using non-food feedstock, such as cellulose, can provide new opportunities. The extent to which food production is a limiting factor for food security can, of course, be debated. One reflection is that during more food-insecure times in history, we used a much higher proportion of agricultural land and produce than today to feed our means of transportation – namely, oxen and horses. That said, policies that pay out subsidies for otherwise unprofitable biofuel production need to be well scrutinized for efficiency, as well as unfair competition with food. A more recent controversy has flared over the use of wood biomass for large-scale energy production, as a means to reduce greenhouse gas emissions. Large-scale policies and subsidy schemes, for example by the European Union, have been at the center of attention. A 2013 article in The Economist argued that the political decisions made to increase biomass in the EU energy mix are causing havoc in the wood market, including by raising competition with traditional forest industries. The question was raised as to whether it is wise to use taxpayers’ money to fuel this development. In addition to concerns over subsidy efficiencies, the article ends by stating that wood energy is worse than coal when it comes to an immediate impact on the climate, and reference is made to scientific findings. Fittingly, the subtitle of the article is “Environmental lunacy in Europe.” This “dirtier than coal” notion was introduced in an advocacy paper by the UK Royal Society for the Protection of Birds, and created an argument that seems to have struck a chord with the media. Other major NGOs have also given considerable space to criticizing biofuels and bioenergy, including the World Resources Institute (WRI). Arguments cover both the food security aspect as well as limited climate benefits. There is a tendency to generalize and politicize – concerns over “global competition for land” and “dedicating land for bioenergy” point to large-scale, mono-objective assumptions that create a false dichotomy between bioenergy and all other land-based benefits. Then, a month ago, a Chatham House report reignited the debate. Like previous inputs, the paper argues that the EU subsidy scheme is a bad use of taxpayers’ money, that the climate benefits are negligible, and that using wood for energy is generally unsustainable and should not be characterized as renewable. The report was contested by 125 signatories of a response from the International Energy Agency, who argued that the analysis and assumptions were incorrect based on at least three major concerns. The debate has since continued to engage academics, activists and policy makers. So what to make of this heated debate? One gets the impression that otherwise credible media and institutes take surprisingly strong and polarized positions against bioenergy. Is there a way to reconcile these views so as to support a sustainable, climate-smart future? It would appear that the bioenergy debate needs a broader and more long-term perspective. Focusing only on subsidy schemes and the associated accounting related to greenhouse gas emissions to meet policy targets in the next few years does not provide a holistic picture of a future that we may want to aspire to. If we, for example, aim at a fossil-free, net-zero emissions future further down the line, we have to look at how the biological systems can continue to supply food and energy in integrated ways. And further, we can’t address emissions in isolation, but must develop pathways where climate benefits go hand in hand with improved prosperity and food security for the world’s poor. We should then embrace that bioenergy has a huge role to play for the foreseeable future. And we have to acknowledge a major potential for technology development to serve a bio-based economy, where energy will continue to be an important by-product. These aspects were discussed at a recent international workshop at CIFOR. One common argument is that it is better to leave trees standing than to burn them. This is a very appealing idea, but it is only correct with a short time horizon, and if you don’t see the forest for the trees, so to speak. 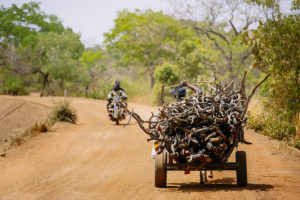 Forest management implies, among other things, that forest productivity is maintained, while allowing for a sustainable harvest of trees for a multitude of purposes, including energy as an important product. This can lead to extraordinary results over the long term. In Sweden, the standing forest biomass has doubled over the last 100 years, and the sustainable harvest has also doubled. Active forestry can therefore deliver more carbon sequestration, more renewable energy, and more economic value, simultaneously! These are the types of long-term goals and perspectives we need to establish before haggling over the effects of short-term policies. That said, there are also problematic issues, mainly with traditional forms of bioenergy such as fuelwood and charcoal. Perhaps most notable are the health problems caused by indoor air pollution, to which is attributed an estimated 4.3 million premature deaths in 2012 – a level of calamity that dwarfs current or predicted consequences of overall climate change. Further, working conditions in traditional bioenergy value chains, such as charcoal, are often poor and risky. Unsustainable harvesting of wood resources for bioenergy has led to the degradation of vast expanses of land in some countries. Emissions of soot and pollutants can cause hazards for communities. All of these are serious matters that must – and can – be addressed, but must not, in my view, be used to generally condemn bioenergy and wood energy as important ingredients in our sustainable energy mix and integrated land-use systems. We need a balanced, long-term and holistic vision of how forests and trees can increasingly provide renewable, clean, efficient and modern energy, supporting livelihoods and a sustainable future worldwide. This is a big part of the solution.